Potatoes in my house often go through three phases. This is especially true during the warmer months. Because I buy potatoes in bulk, sometimes we get tired of eating them, and they sit around longer than anticipated. 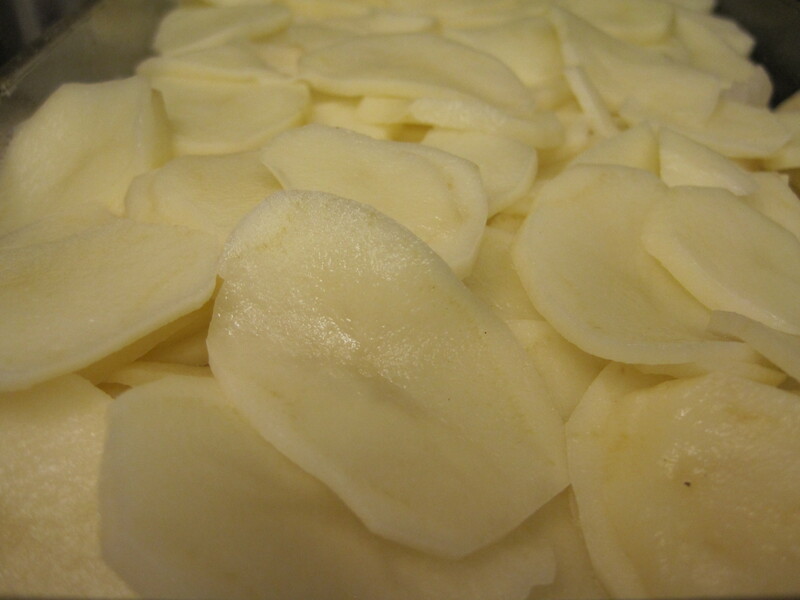 The first stage my potatoes have is the picture perfect potato that can be baked or steamed and served whole. The second stages occur simultaneously as some potatoes become wrinkled and other have small eyes sprout. Once potatoes have reached this point, they are too ugly to bake. In order to use them, they must first be peeled and any eyes cut off. 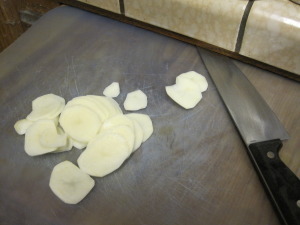 Of course, there is a fourth phase when the potatoes are rotten and inedible. We try to avoid that phase altogether. When they’re rotten, the only thing that can be done with them is to throw them into the trash. Almost everyone agrees that it’s OK to eat potatoes that have sprouted as long as you remove the sprouts and the eyes. There are many mixed opinions about the safety of eating wrinkled potatoes. You will have to make your own decisions. Personally, I wash them, cut them in half and if they look and smell okay, I peel them, cook them, and we eat them. I learned this from watching my mother who began her married life living out in the country and living off of the land. They had a root cellar where they stored root crops and all of the things they canned. Most of their food came from crops they grew and the animals they raised. Anything else they needed, my parents bartered for with their surplus. It was hard work, but they found it fulfilling. I recently found myself staring at a bag of potatoes that had begun to sprout. I realized that I would have to come up with a use for them quickly, or we would be throwing them out. After carefully considering these potatoes, I decided that I would make some Old Rotten Potatoes. Old Rotten Potatoes is what my youngest heard whenever we said we were having Au Gratin Potatoes. As a result, that’s what we have called them for years. WE DO NOT EAT POTATOES THAT ARE ROTTEN. 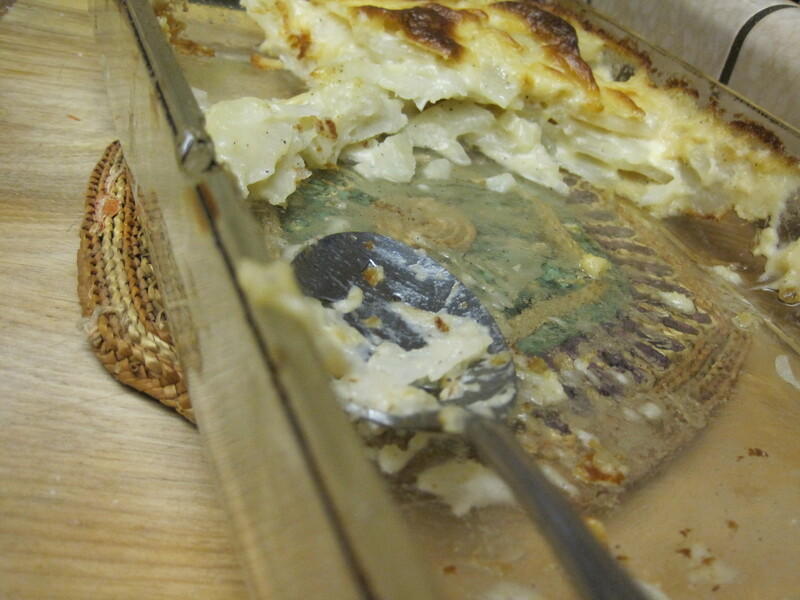 This dish is made from potatoes that are edible, rotten potatoes have to be thrown out. It’s really sad, but this must be said. 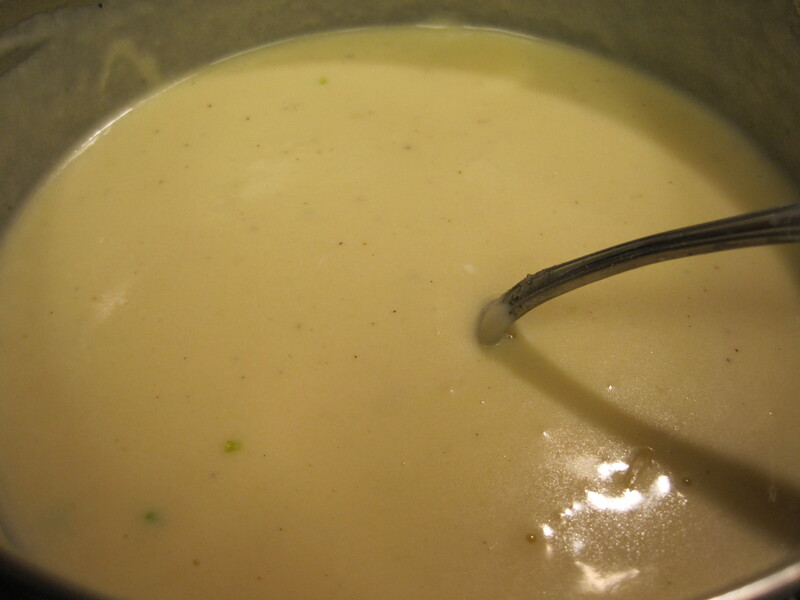 My recipe is very straight forward and fairly simple as long as you know how to make a white sauce. It’s really easiest if you have someone to help with washing and peeling the potatoes while you make the white sauce. 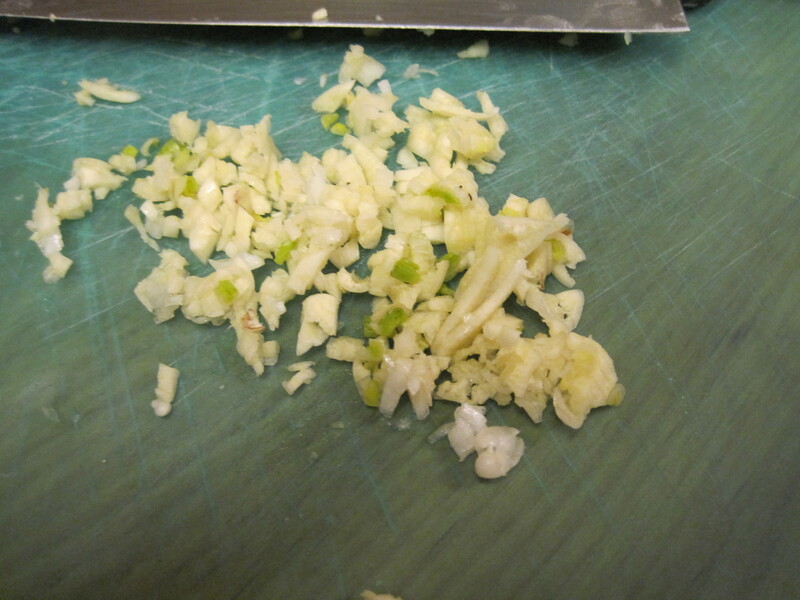 Children armed with peelers sometimes make wonderful kitchen helpers. 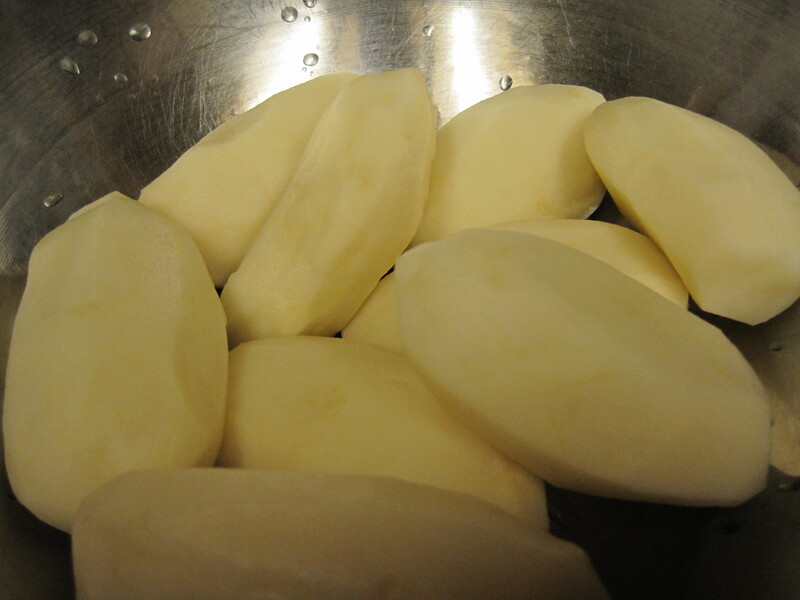 I began by washing and peeling my potatoes. 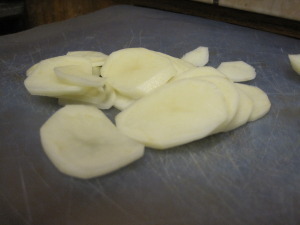 The potatoes were then thinly sliced. I sprayed a 9X13″ pan with non-stick spray and arranged 1/2 of my potatoes on the bottom and sprinkle them with salt and pepper. I sprinkled chopped onion on top of the layer of potatoes. I added the remainder of the sliced potatoes and sprinkled them with salt and pepper. I shredded 2 cups of cheese. Jack and Cheddar were my choices, but this can be made with your favorite. The white sauce was prepared by melting butter with some crushed garlic in a sauce pan. An equal amount of flour was stirred in to make a paste. The flour and butter mixture, also called a roux, was cooked for a few minutes but not allowed to brown. Milk was added to the pan. This was stirred over medium heat until the sauce thickened. 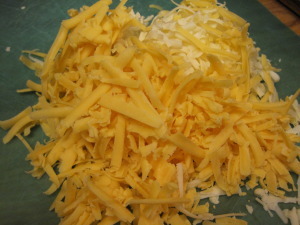 Shredded cheese was added along with more salt and pepper and stirred until the cheese was melted and the sauce smooth. The potatoes were baked for 1 hour until the potatoes were tender and the entire casserole was lightly browned. I served these with ham steaks and green beans. They were delicious. My family of 4 devoured nearly everything. There was enough left for me to take a serving for lunch the next day. 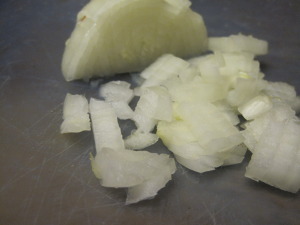 If you wanted, you could add some chopped ham to the layers of potatoes and onions before baking and turn this into a one dish meal that could be served with a salad. Here’s the recipe. Give it a try and let me know what you think. 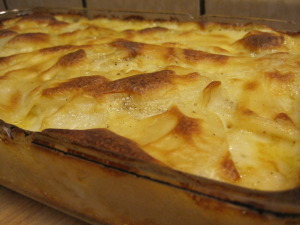 Potatoes and onions are layered and covered with a cheese sauce before baking in a moderate oven until golden brown and bubbly. 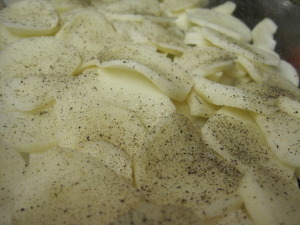 Arrange half of the potatoes in the bottom of a 9X13 inch pan that has been sprayed with non-stick spray. 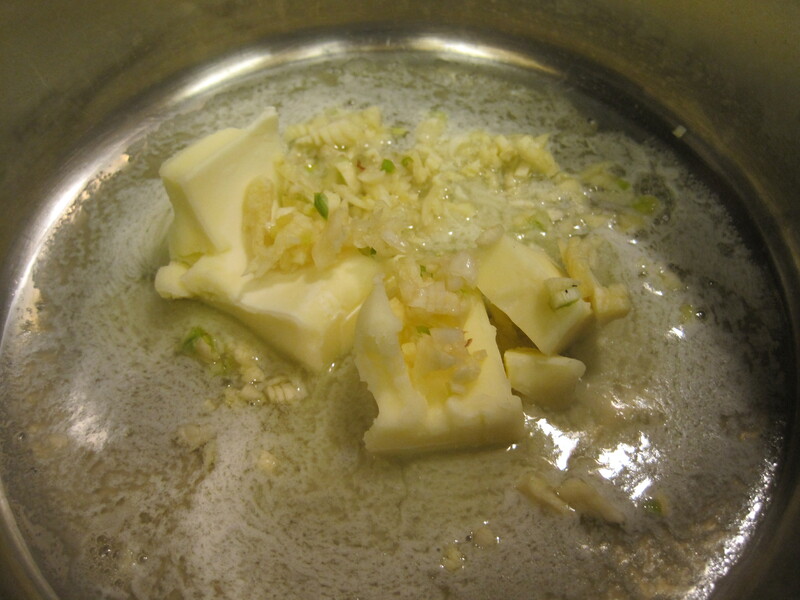 In a 2 quart sauce pan, melt butter with minced garlic. 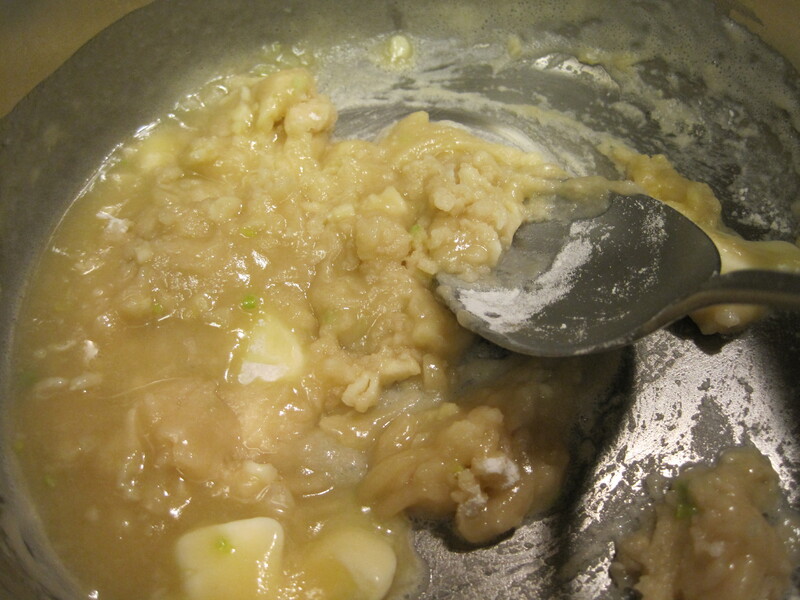 When butter is melted, add flour and stir to make a paste. 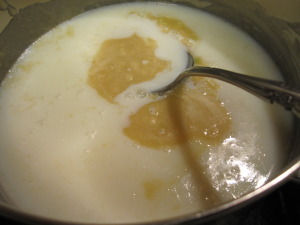 Add milk, whisking until flour and butter mixture is incorporated and there are no lumps. Stir constantly over medium heat until mixture comes to a boil and the sauce thickens slightly. Add shredded cheese and stir until the mixture is smooth. If it gets too thick, you many need to add a little bit more milk. 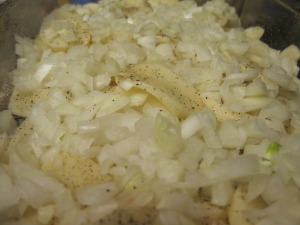 The sauce needs to be thin enough to run between the layers of the potatoes, but thick enough that the final dish won't be runny. 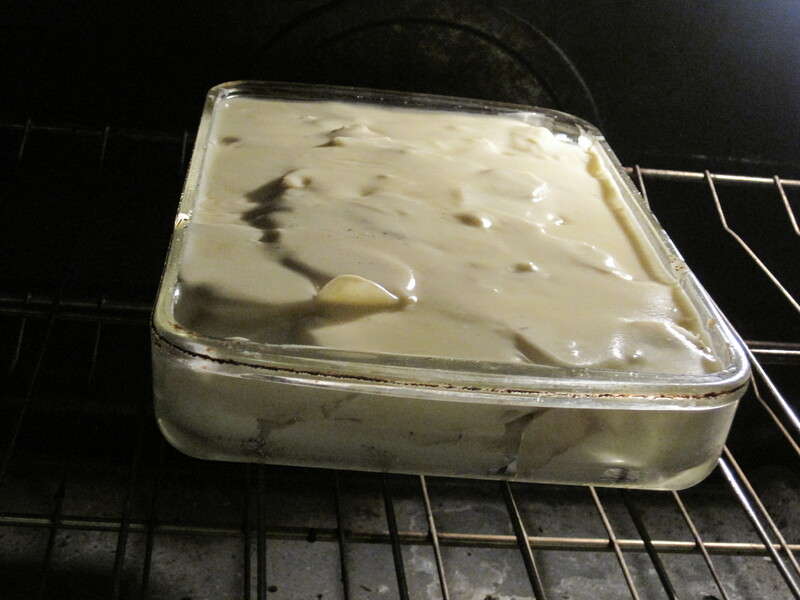 Keep in mind that it will thicken more during the baking process. 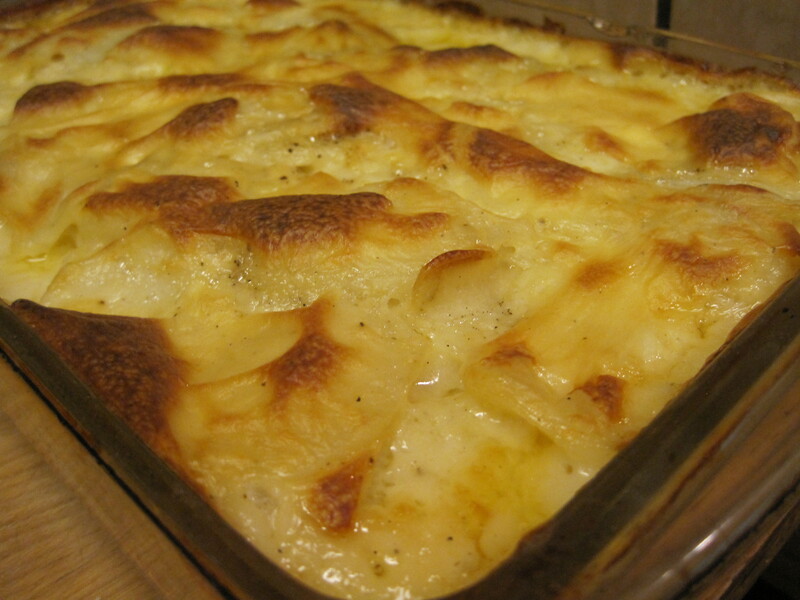 Bake at 350 degrees for 1 hour or until potatoes are tender and the top is lightly browned.